The Hostel Laguna Park Cabarete is under new management as of the 15th November 2015. We aim to provide great value for open minded travelers from around the world who like to share and meet others while having the best time in Cabarete. LagunaPark is located right in front of the green lagoon of the Cabarete National Park. Those who prefer the sounds of birds and the wind rather than loud music and noise from the street, will truly appreciate the tranquility of LagunaPark. One of the things that makes Laguna Park so special is its unique appearance, unexpected from the exterior and interior new and clean. Colorful, modern, yet simple - Laguna Park certainly offers everything a traveler needs. 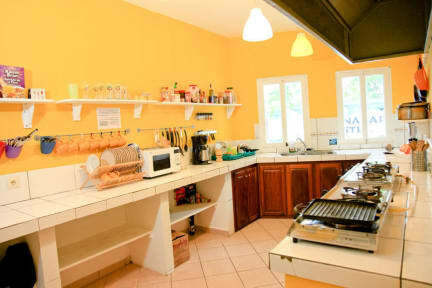 The lodge has 12 large bedrooms and spacious private rooms, and places about 50 people. Usually there is always a constant number of 10-25 people who live here and this creates a friendly, family atmosphere with it's own dynamics. The large shared living room, guests at LagunaPark have the opportunity to meet and hang out. Comfortable sofas, plasma TV, on-site bar, pool table, and free Wi-Fi make life here at LagunaPark very pleasant. We try to run weekly movie nights, pool volleyball nights, latin music dance classes before salsa night in town (Thursdays), casual pool parties, and are always up for more suggestions and ideas for making this place a great place for backpackers. We can also help you to arrange your activities either here or in other parts of the island.